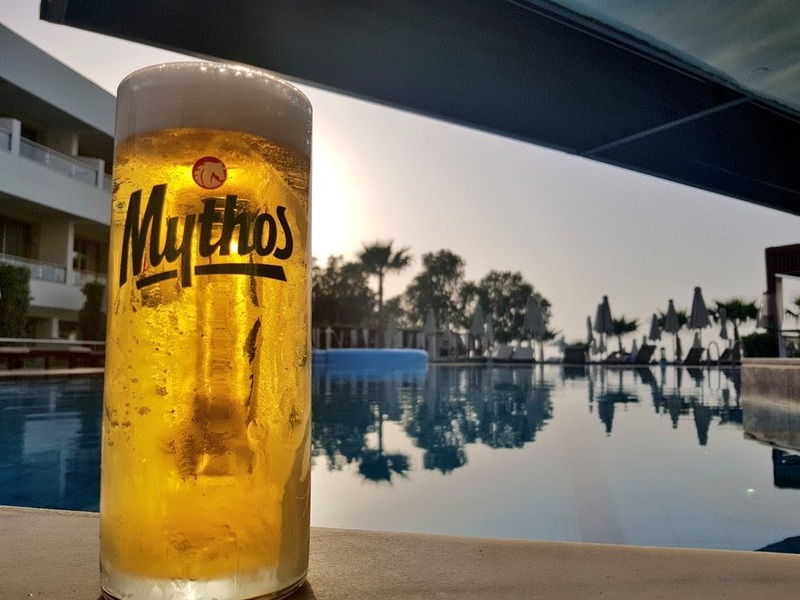 My first beer in Crete was Mythos on draught at the pool. I mentioned it in the last article about Athens that Mythos in a green bottle was my first beer in Greece. It wasn't great in the bottle. It's owned by Carlsberg by the way. On draught however, it's a lovely malt forward lager. I had quite a number of them at the hotel. The pool at the resort by the way is pretty cool. You can swim right up to the bar and sit on underwater bar stools. In that scenario, charge to your room t avoid soggy cash. We were staying near Platanias in the Agia Marina area. It's a long strip of shops and restaurants in between hotels and resorts. There didn't seem to be much in the way of craft beer though the local supermarket had a decent enough selection. On the second night, we asked for a restaurant recommendation from reception. Nymfi was recommended as one of the best local restaurants so headed there. While I checked out their menu outside, Pauline checked out a smaller place across the road. I wasn't immediately drawn to Nymfi's menu but Pauline called me over and said that this place looks like they brew their own beer. The restaurant was called Nostos and as it turns out, had only opened a few weeks beforehand. They brew their beer there and while the brewer/owner came over to us for a chat, I didn't ask for a tour since we were on honeymoon. 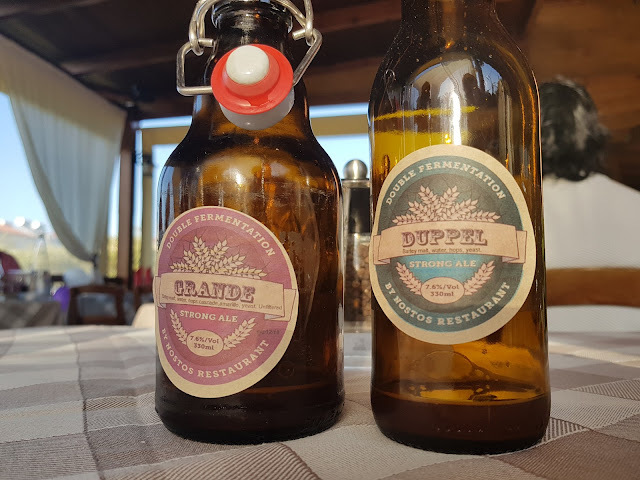 The beers they brew as Belgian inspired but usually American hopped. It makes for some great beer for pairing with food. They are only in bottle and there's an element of homebrew about the presentation as you can see in the images. 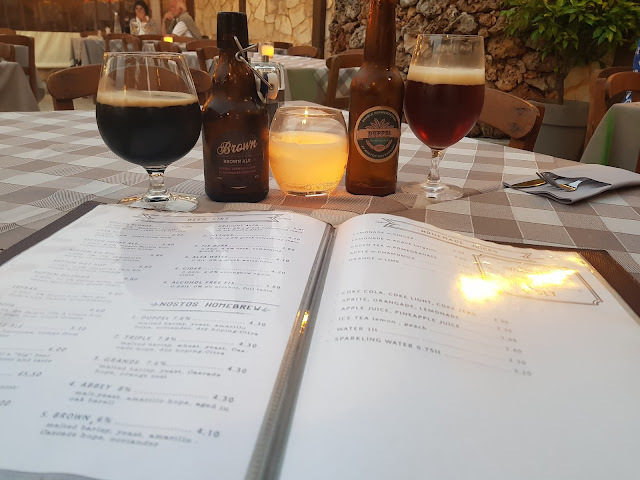 On the three nights we visited Nostos, we ordered beer first and then had wine with our main courses, mostly because they have some excellent local wine available. 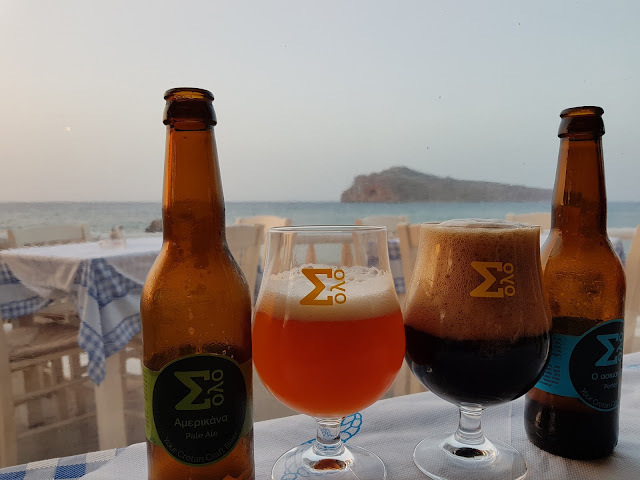 Another Cretian beer I came across at another restaurant was one I can't pronounce or read due to the alphabet used but Σoλo is a brewery based in Heraklion, the largest city at the far end of the island. I didn't get to visit that city so thankfully the beer was available. I would say that the pale ale seemed a little stale, potentially as being a restaurant, there might be slow turnover. The porter stood up a lot better though and was pretty damn good but then again, it was 7% so I would expect it to age nicely. 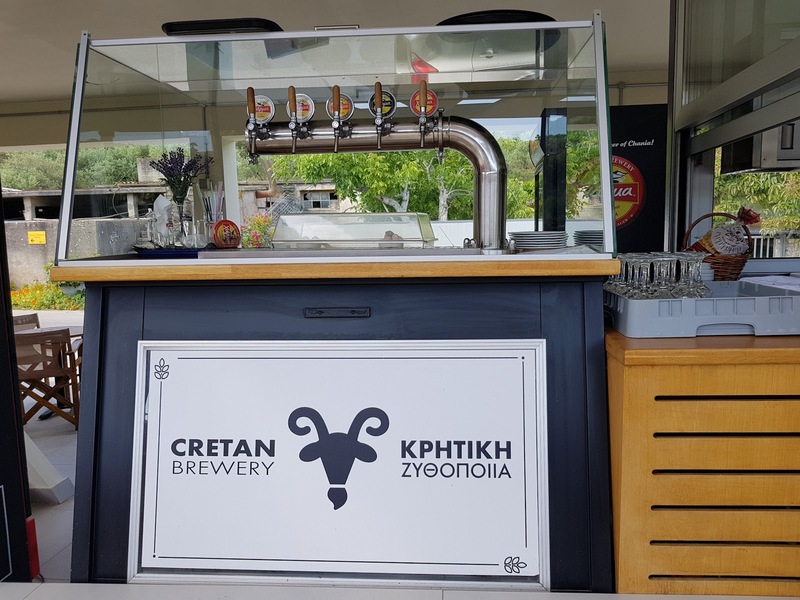 By far, the craft beer with the furthest reach was from the Cretan Brewery in the hills outside Chania (Hania). I actually visited this as part of a private wine tour since one of the usual vineyards was closed on Sundays. This of course suited me nicely. 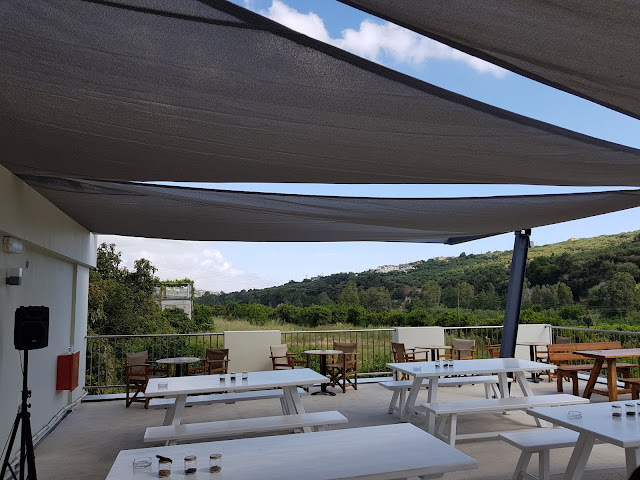 The private tour was with Chania Wine Tours and is well worth the money. One odd thing I noticed was that there's some brand confusion going on. 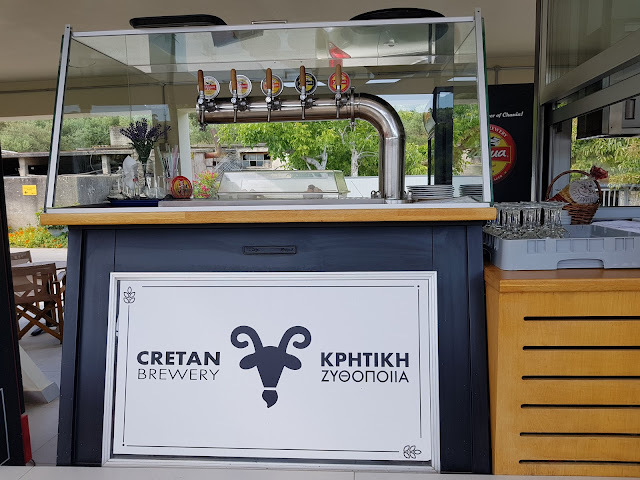 In the image above, the modern goat logo and simple name of Cretan Brewery is clean and simple. Indeed some of their swag in the shop sported this newer design. The older looking logo on the red and yellow beer mat looks a little dated. They haven't i[dated any of the taps yet. 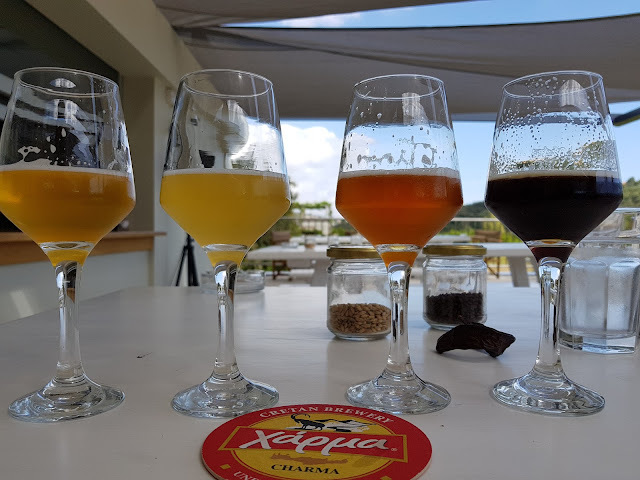 The brand of the beer is called Charma (Carma) or Χάρμα in Greek. It's a remote location but it has a great view. It can be reached by taxi of course, though be careful of Greek taxis. You can also get there on The Little Fun Train during one of their tours but you only get to spend a short time there. Apparently there is a limited bus option too. One thing worth noting is that the beer is draught only, unless you visit the brewery where they keep some beer in bottles to purchase. These appear to be hand bottled as the fill levels vary significantly so be on the lookout for under-filled bottles. Here's a panorama of the harbour which I took from the lighthouse. It's a lovely little city and harbour area with many narrow little alleys full of cafés, restaurants and art shops. Don't forget all the souvenir shops though. The place to be is down by the harbour though. The whole stretch is almost exclusively bars and restaurants and a number of them sell Charma beer. I was a big fan of their Dunkel lager but their regular Helles is also a lovely and flavoursome unfiltered lager. For food, I recommend Salis. The food is incredible for the most part and their wine list is very impressive. They also happen to have Charma beer on draught. 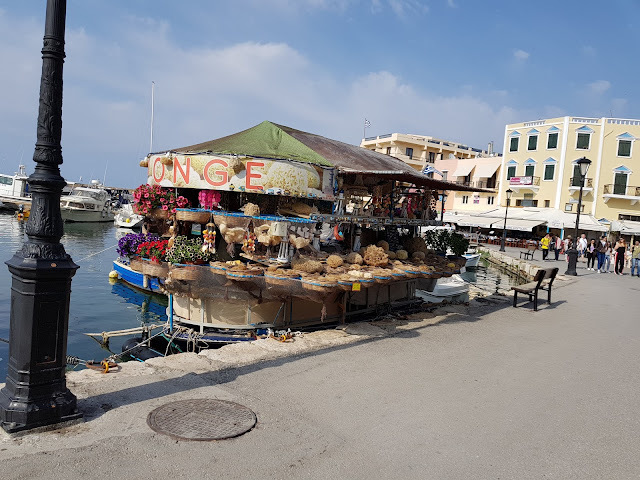 Keep an eye out for the boat outside that sells sponges. They owner basically looks like Popeye and it ads some visual amusement. The two best main courses we tried were lamb osso buco and a truffle risotto which was simply stunning. 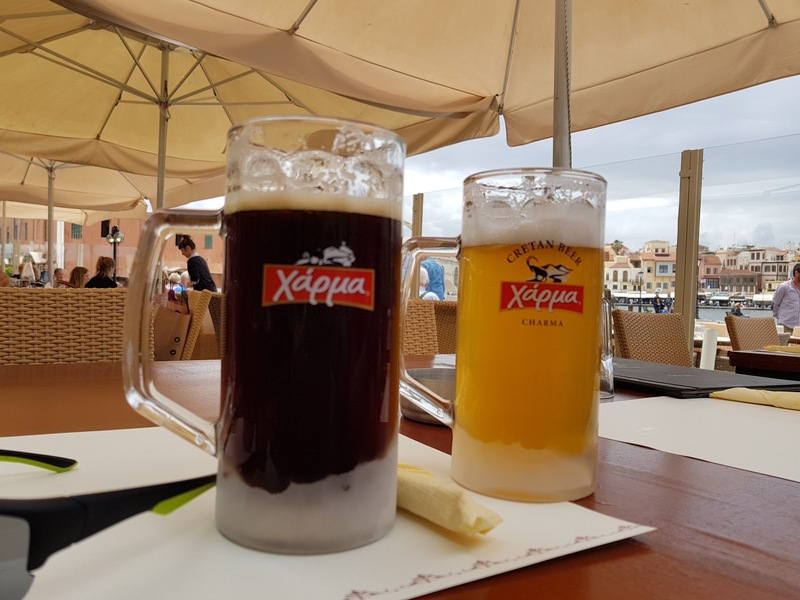 Crete might not be a traditional beer destination but if you find yourself there, you won't go thirsty, that's for sure. Σoλo, which transliterates to Solo, is the brewery that was set up by ex-Nøgne Ø founder/brewer Kjetil Jikiun when he left there and moved to Crete. A Choice: Munich or Bamberg?